an organisation has an anti-corruption framework in place, but how effective its framework is. Failure to implement an anti-corruption programme that works, can have far-reaching consequences. 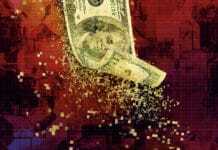 The first – and most obvious – is exposure to losses from fraud and corruption itself. This is not the only risk however, as there is a growing number of jurisdictions around the world, where a failure to apply effective processes and procedures that prevent employees (or agents) from offering bribes, will result in severe financial penalties. Although there is no silver bullet or ‘one-size-fits-all’ approach to designing and implementing an effective anti-corruption framework, there are a number of critical elements that should be included. I will outline several of them in this article, including how they can be implemented. For an anti-corruption effort to be successful, it needs to be part of an integrated holistic approach. The structure, or framework, needed for this is made up of a number of inter-related components, which when combined, form the foundation on which to anchor the individual initiatives. Each element plays a critical role in countering corrupt behaviour, while at the same time helping develop a strong ethical culture. Although anti-corruption programmes should be founded on a risk-based management approach, this is only one component needed to develop an effective anti-corruption framework. So what does such a framework look like? Tailored to meet an organisation’s unique corruption-risk profile, an example of a generic anti-corruption framework is outlined in Figure A (below). Made up of a series of interlocking components – or building blocks – it is broken down into three main parts: the pillars that hold the framework up; the foundation on which they are built; and the overarching structure that binds it together. Each of these is outlined in more detail below. the framework’s main building blocks. While the number used will vary depending on the organisation’s specific context, the framework outlined in Figure A contains six. As a general rule, they should be based on the three elements (or themes) of corruption prevention, detection and response (see Figure B). An integrated corruption prevention and control strategy is an essential component of any anti-corruption framework. Made up of both a corruption control strategy and a plan on how it is to be implemented, the strategy should include a clear definition of corruption and the approach used to control it (at strategic, tactical and operational level). Supporting the strategy, the corruption control plan outlines the intended actions needed to implement and monitor the various corruption prevention, detection and response initiatives required. Both the corruption control strategy and the corruption control plan should be reviewed on a regular basis. A key strategy in managing corruption is the implementation and maintenance of an ethical organisational culture. Central to this is a comprehensive code of ethics. Containing a high-level aspirational statement of values, it should also include specific details of the types of behaviour the organisation deems as unacceptable. To be as effective as possible, it should be aligned and integrated with the organisation’s corruption prevention policy. At the heart of anti-corruption efforts is a proactive risk-based management approach. Identifying corruption risks will enable the organisation to develop the appropriate risk-mitigation strategies, and assign corruption prevention resources to where they are needed most. As part of this, a comprehensive risk assessment should be carried out (at least annually) in which all potential fraud and corruption risks are identified, analysed and evaluated. Early detection is vital in order to limit the spread of corrupt conduct and minimise damages from it. While the majority of cases are reported by tip-offs, managers play a key role by ensuring they provide the appropriate level of supervision and checking. An effective organisational internal reporting system, sound complaint and grievance processes and a comprehensive internal audit and work review programme, also facilitates detection. The implementation of a whistleblower system is also essential. Responding effectively to suspected cases of corruption is critical. This involves a well-conducted internal – and if necessary external – investigation to ascertain the facts. If proven, prompt reporting to the police (and/or other bodies where necessary) and appropriate disciplinary action is essential. The information gained and lessons learned from each case, should form part of an on-going review of corruption prevention controls to ensure they are as comprehensive and effective as possible. The most important anti-corruption resource at an organisation’s disposal is its own staff. In the majority of cases, employees will come forward if they know what to look for and how to report it. Formal and informal education and corruption awareness raising is essential. Encouragement and space should be given to allow staff to openly talk about the topic, making them more comfortable about coming forward if an issue subsequently arises. 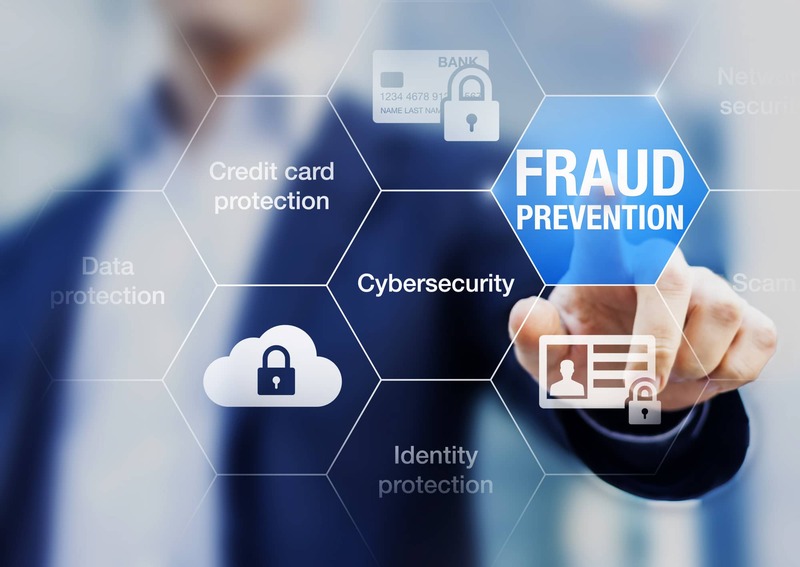 Many fraud and corruption cases continue for years before they become known to the organisation, as managers and/or staff are not aware of the warning signs, or the atmosphere is not conducive to reporting them. Put more succinctly, if an organisation’s leaders do not demonstrate they are genuine about anti-corruption, why should their staff? The issue is even more important if the existing organisational culture has indirectly tolerated or ‘ignored’ corruption. The second is sufficient and appropriate resourcing. While this should be an automatic ‘given’, surprisingly, a lack of resources continues to be a key reason why so many anti-corruption programmes fail to produce the promised results. While not the only components required to lay a strong anti-corruption foundation, the right tone at the top, backed up by sufficient political will and the appropriate level of resources to make it a reality, more than anything else, will dictate the organisational values that are rolled-out. The third element of a successful anti-corruption framework is its overarching structure. The key here is strong and consistent enforcement and deterrence, backed up by a high level of transparency. To be effective, anti-corruption programmes must be backed up by an effective enforcement mechanism. Without this it runs the risk of becoming a ‘toothless tiger’. Strong and consistent enforcement demonstrates an organisation’s genuine commitment to fighting corruption. 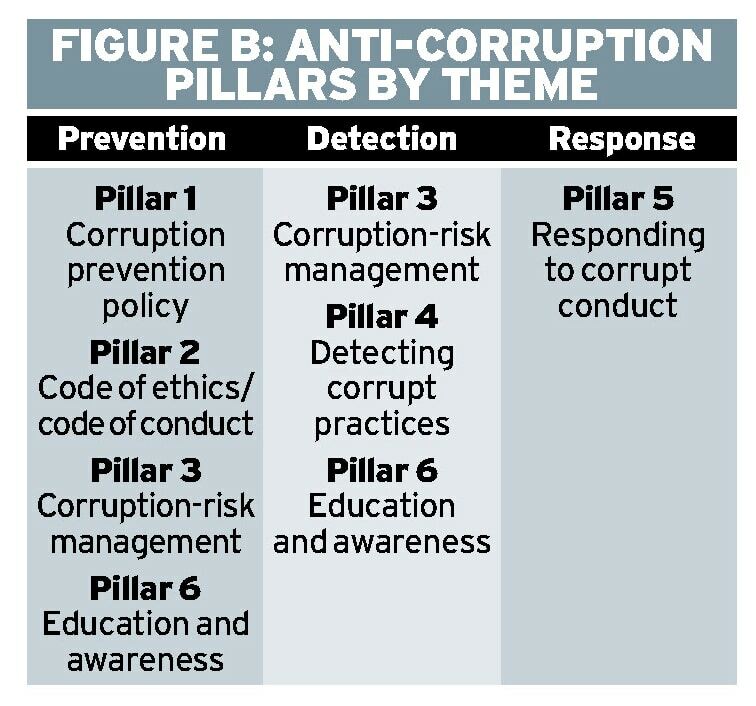 It is also a reflection of the effectiveness of its anti-corruption framework, as successful enforcement actions serve as a strong deterrent to those acting (or thinking of acting) corruptly. If there are no sanctions in place – or worse – sanctions aren’t actively enforced, those acting corruptly will continue to do so, while those who would normally report wrongdoing would be reluctant to come forward (drastically reducing the deterrence factor). In other words, a combination of secrecy and the failure to strongly enforce sanctions, is the antithesis of corruption prevention. The final aspect of an effective anti-corruption framework is its implementation. While there is no ‘right-way’ of doing this, the process should be iterative in nature, with the structures needed to achieve it being well embedded into the broader organisation. While a phased approach is the most common method, it is important to ensure that the various building blocks outlined above, are implemented at the right time and in the right sequence. The argument that designing and implementing an anti-corruption framework is complex and resource heavy is a fallacy. While it is best to involve an experienced anti-corruption specialist in the process, the overall level of resources required to achieve a good return on investment does not have to be excessive. Of greater importance is the level of commitment, along with a genuine desire and belief that corruption can be prevented. Jeremy is a global anti-corruption expert with 25+ years combined experience in the corporate and international development sectors. 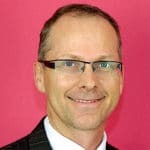 He is the founder and Chief Executive of Integritas360, an organisation that specialises in designing and implementing bespoke solutions to addressing challenges in the inter-related area of anti-corruption, integrity, governance, and accountability. Prior to this, he spent 12 years working in the international development sector in Sub-Sahara Africa and Europe. Jeremy is one of only a handful of people with direct first hand experience in all aspects of anti-corruption: from uncovering, managing and investigating fraud and corruption in countries such as Malawi, Kenya, Mozambique, Israel, and Somalia; to designing and implementing global integrity and anti-corruption frameworks. He also lectures on the topic at the University of Sydney’s Centre for Continuing Education. 1The two most notable pieces of anti-corruption legislation with extra-territorial reach, are the U.S. Foreign Corrupt Practices Act (FCPA) and the U.K. Bribery Act. In the case of the FCPA, the largest fine levied to-date is USD 772.3 million against Alstom, after the French conglomerate pled guilty (in 2014) to paying bribes in various countries around the world. 3Statements such as “that´s the way it works here” and “corruption is just part of how business is done!” are examples of an organisational culture that tolerates corruption. 4While it may sound expensive, the level of resources required to implement an effective anti-corruption programme is not excessive. A case in point is the Hong Kong ICAC, one of the most successful anti-corruption agencies in the world. Also one of the most expense, in 2002, they had an annual budget of around USD90 million. While this many sound like a lot, it constituted just 0.3% of the entire Government’s budget and a meagre 0.05% of the island’s total GDP. 5A good example of this is are the ongoing corruption probes into FIFA’s leadership, which clearly demonstrate just how easy it is for (what on paper) appear to be a ‘strong’ and ‘robust’ anti-corruption framework, to be undermined by the ‘top’. 7See UN Global Compact & Transparency International. (2009). Reporting Guidance on the 10th Principal against Corruption. New York: United Nations Global Compact. Previous articleDo you have a life plan?